It is estimated that pet owners alone spend over $1 billion each year controlling fleas. Adult fleas are not only a nuisance to humans and pets, but can cause medical problems including flea allergy dermatitis, tape worms, secondary skin irritation and in extreme cases, anemia. 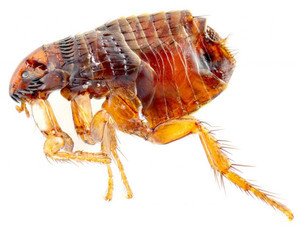 Fleas pass through a complete life cycle consisting of egg, larva, pupa and adult. A typical population consists of 50% eggs, 35% larvae, 10% pupae, and 5% adult. Completion of the life cycle from egg to adult varies from two weeks to eight months depending on the temperature, humidity, food, and species. Typical hosts are dogs, cats, rats, rabbits, mice, squirrels, chipmunks, raccoons, oppossums, foxes, chickens and humans. Outdoor development occurs in sandy gravel soils. Sand and gravel are very suitable for larval development which is the reason fleas are erroneously called "sand fleas." Adult fleas may survive without a blood meal for two months up to one year. The most important thing to controlling a flea infestation is to treat the house, yard, and any pets within a 24-36 hour period. Also don't forget the vehicle if you transport your pets at all. There are Insect Growth Regulator (IGR) for fleas which we give you a residual spray for the inside flooring and it prevents the adults from reproducing for up to 7 months thus breaking their life cycle. For outdoor treatments you can use Granular Insecticides and /or a Liquid Insecticides that have a residual to spray the yard such as the ones listed below. For the pet we offer Petcor, a spray that contains an adulticide and Bio-Spot treatment for long lasting control of fleas and ticks. These are good for dogs and cats in accordance to their weight.